Monday I wrote about kindness as a fruit of the Spirit. Today I want to talk more about societal kindness. 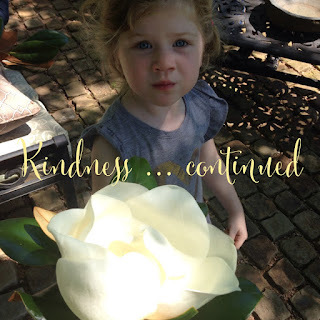 When I dug into kindness for Monday's blog, I started out thinking it was just being nice to others. Doing favors for others. Pay it forward. I mentioned Monday that I wasn't discounting those things or excusing Christians from these profitable practices. But today I want to contrast what I perceive kindness has come to mean in our society. Monday I shared the dictionary definition of kindness: the quality of being friendly, generous, and considerate. In the end, these are all about how the receiving party feels. While useful goodness from the Holy Spirit may often be uncomfortable, the culture we live in seems almost to define kindness as "not making me uncomfortable." The Holy Spirit would not bear fruit that is contrary to God's commands. God would not have us stand up to sin and have that cause us to be fruitless. Sometimes our unmovable Spirit may be a kindness to the world even if the world rejects it and calls it hatred. All this thinking about the contrast between God's definition of kindness and our own gave me something of a revelation. Heated debates rage on a weekly basis on social media between Christians standing up for their beliefs and a world wanting everyone to "be kind" ... don't make me uncomfortable, don't tell me I'm sinful ... swallow your so-called truth and just be loving because I heard God is the God of love. That means you have to be nice to me. Judge: You have been accused of hate. Hate is a crime. How do you plead? Judge: Then answer this question for me ... do you consider [fill-in-the-blank] to be a sin? Christian: Yes I do; the Bible is clear about that. [You may even be able to cite verses]. Judge: Your refusal to accept the segment of society that practice [fill-in-the-blank] is hatred. Do you not realize that unless you accept that [fill-in-the-blank] is NOT a sin, and stop telling people such, that you are guilty of a hate crime, punishable by imprisonment? You are basing your freedom on a concept from a book that has been determined by all three branches of government to be hate paraphanlia. I will ask you one more time, and I ask you to carefully consider what your answer will cost you; do you believe [fill-in-the-blank] to be a sin? And as such for the so-called sinner to deserve death unless they accept the concepts outlined in the hateful Bible? Christian: I not only believe [fill-in-the-blank] to be true but I know that the Holy God, being Holy, must follow through with the punishment for sin if the sinner has not accepted Christ's sacrifice! Why do I paint such a dour picture of our country? Because it was given to me. It seems surprisingly feasible if the current trends continue. Because God's kindness here is a righteous kindness, not what we have defined as kindness. While researching the word kindness, I found a fascinating tool by Google where you can see trends of words as a percentage of available writings over the years. Kindness is seeing a resurgence of popularity in English writing. But be careful before you lump the fruit of the Holy Spirit in with the fruit of our culture. I doubt the slight kindness upswing in the last 10 years of this graph is quite the same as useful goodness.